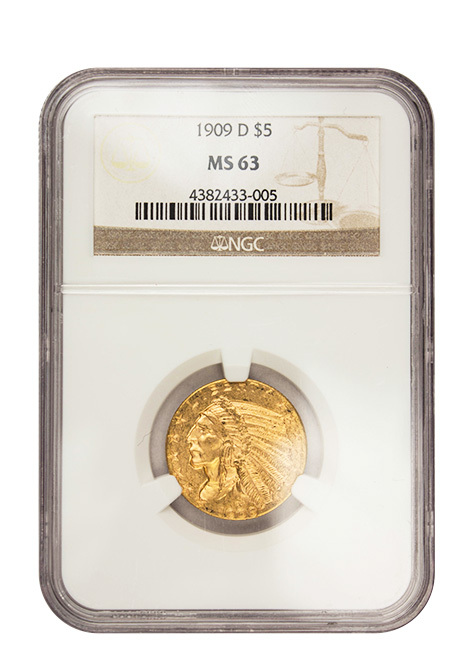 A student of Augustus Saint-Gaudens, sculptor Bela Lyon Pratt designed the $5 Indian, as well as the $2.50 Indian. President Theodore Roosevelt played an important role in revamping the $5 Indian and was referred to Pratt by a friend, Dr. William Sturgis Bigelow. 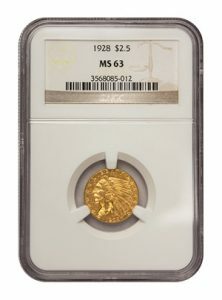 The picture of an Indian Chief is featured on the obverse (front) of the coin. This marks the first true American Indian to ever appear on U.S. coinage. 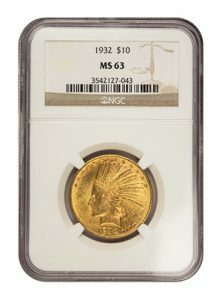 The chief is wearing a feathered headdress, encircled by the word ‘LIBERTY’, 13 stars, and the minting date. The reverse (back) features a bald eagle standing among olive branches, surrounded by the words ‘UNITED STATES OF AMERICA’. The motto ‘IN GOD WE TRUST’ and the denomination also appear on the reverse. 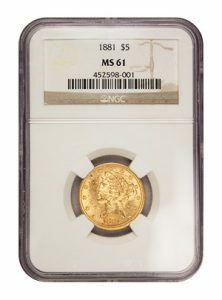 A technique known as incus relief was used on the $5 and $2.50 Indian gold coins, which gives the design elements and lettering a sunken-in appearance on a flat plane.